Even though we can’t and wouldn’t want to do away with all our electric appliances, we can protect ourselves. A simple Multi‐Polar Magnet, no bigger than a credit card, can energize your energy field and protect you. 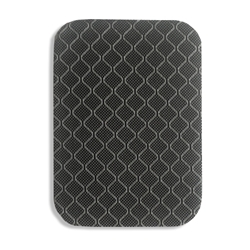 This small multi‐polar magnet can be placed in a shirt pocket, inside a woman’s bra or in a wallet carried on the body. We use very specific magnets that change from north to south on the same side, four to five times per inch, and they’re under 350 gauss no matter where you measure them.